If there is one and only one thing that has been made clear so far through three episodes of Westworld season 2, it's that this show is going to continue down the path of mystery upon mystery and non-linear storytelling whether we like it or not. But hey, the good news is we finally know what's up with that crazy robot tiger. Kind of. Let's dig in, shall we? The latest episode of Westworld, titled Virtù e Fortuna, opens up with some characters we've never met in a location we've never been. A mystery man and mystery woman courting one another in what we come to learn is one of the other parks. While the park isn't named explicitly, it's clear this is a hunter's delight and is based around some sort of wild Indiana safari theme. After this man and woman have a rather tense hook up, they go out on a hunt for a tiger, only to find that the hosts in the park have gone off the rails and have started murdering everyone. That includes the very dangerous robot tiger they were hunting who, unfortunately for our new mystery girl, tackles her off of a cliff into the water below. Amazingly, as we find out at the end of the episode, she lives, only to be discovered by the Indians in the main park. The good news is, we know where the tiger came from and why it was laying there dead in the water. The bad news is, the CGI for said Tiger didn't look as great as maybe we could have hoped. But still, who knows what else is hiding in that jungle for us to discover later? This sequence also showed just how twistedly realistic the park(s) can be, as this new mystery couple had to literally test one another out with host-safe guns to make sure they were both human. Naturally, we then jump to what is presumably the most recent part of this season's timeline, which has us back with the clean-up crew who are trying to figure out what happened at the park and how to clean it up. Bernard (Jeffrey Wright) is with them and they come across his old pal Charlotte (Tessa Thompson) survived being out in the park with the wild, deadly hosts after the season 1 finale. She then asks Bernard, with some suspicion, if they've found Peter Abernathy yet, who we know is housing some very valuable secret within. 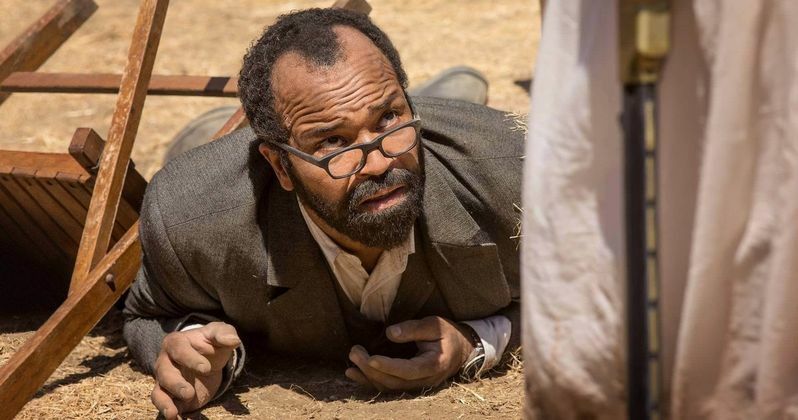 We then go back in time to find Bernard and Charlotte coming across Abernathy, who had been captured by some of the hosts in the park. After sort of botching a rescue attempt, in part because Abernathy was feeling rather noble, Charlotte escaped with her life and Bernard was captured. Moving on, we see Dolores (Evan Rachel Wood) coming across an army of Confederates whom she is trying to convince to join up with her in order to face down the heavily armed clean-up crew that will be coming down on them shortly. As we see, Dolores has already assembled a pretty sizable and savage force and, via a violent demonstration that involves a machine gun and a human who is very dead now, she convinces them to join up. They begin to hatch an attack plan and, as Dolores is exploring their camp, she realizes they've taken both her father, aka Abernathy, and Bernard hostage. The reunion with Dolores and her father is far from sweet, as something is very clearly wrong with him. She then tries to have Bernard fix him before the attack the next day. Bernard does his best, but he discovers that there is something hidden within Abernathy. We can clearly tell that Bernard uncovers what it is at one point, but he doesn't reveal what exactly he's discovered. During this portion of the episode, Dolores and Bernard have one of their signature chats, but it's a little less structured then we're used to seeing. Things get dark as we realize just how far down this path Dolores has gone. When asked what she wants, Dolores answers, "To dominate this world." This whole thing culminates with a massive battle between the heavily-armed humans and the poorly armed Confederates. Dolores is much more wicked than we ever realized, as she sacrifices all of the Confederate troops, allowing them to be slaughtered as they detonate some hidden charges, killing quite a few unsuspecting troops on both sides. It's a pretty awesome battle, but one that comes at a price, as Abernathy is captured by Charlotte. After the battle, Dolores orders Teddy (James Marsden) to execute who is left and, as we come to find out, he doesn't have the same bloodlust that the love of his life has. They clearly have a difficult conversation coming in the near future. Elsewhere, we see that Maeve (Thandie Newton) is further along on her quest to find her missing child. Unfortunately, they come across the local Indians, who aren't too happy with their being on the land. Simon (Lee Sizemore) leads them to safety, only to re-discover Hector's (Rodrigo Santoro) extra-violent ex-girlfriend, as well as Maeve's old buddy's Felix (Leonardo Nam) and Sylvester (Ptolemy Slocum) along the way. Her posse is growing in size and, after gathering up with one another, they head back out into the park. Coming across a snowy landscape, they seek refuge at a burning fire that is unattended to. What we discover is that there are beheaded bodies buried in the snow and Simon warns that they must leave. Before they can, a Shogun warrior, sword in hand, comes charging at them out of the woods! And that's where we leave off. You know what that means, everyone. Looks like we're finally going to Shogun world next week! Westworld returns to HBO next Sunday.